It must be autumn, because I’m watching The Walking Dead. Not just one episode, either. Multi-episode binge watching on Netflix. My husband is out hunting and I am free to work on my projects and watch what I like. Just like the seasons, my TV habits and my creative life operate in cycles. After making a bunch of crocheted socks last winter while working up north, I didn’t touch a knitting needle or crochet hook all spring or summer, focusing on scrapbooking and photo albums instead. Every year autumn brings me back to crochet and knitting, and this year I’ve come back to it excited and inspired. I’ll be trying new techniques and coming back to some of my old favourites. One technique I’ve returned to is Tunisian crochet. The thick, cozy fabric it makes is perfect for winter accessories. I haven’t made anything this way for a few years, but after watching Lily Chin’s video tutorial on two-colour Tunisian crochet in the round on Craft Daily, I decided to dig out my hooks and get crafting. My first project was an iPad Air slipcover, made with Red Heart Treasure yarn in Tapestry. The Tunisian simple stitch really pops in this variegated yarn. The fabric is thick and gives some padding to protect the iPad. The next project, my WIP for the weekend, is a new design by me. It’s a boy’s jacket, worked in Tunisian simple stitch with cables on the front and back of the jacket. Normally when I work cables I do them in knitting. I have avoided crochet cables, because I thought they would look cheesy, but I was wrong. I love the results! With this plain acrylic yarn (Red Heart Love in Pewter), the cables can stand out and don’t get lost in the texture of the yarn. 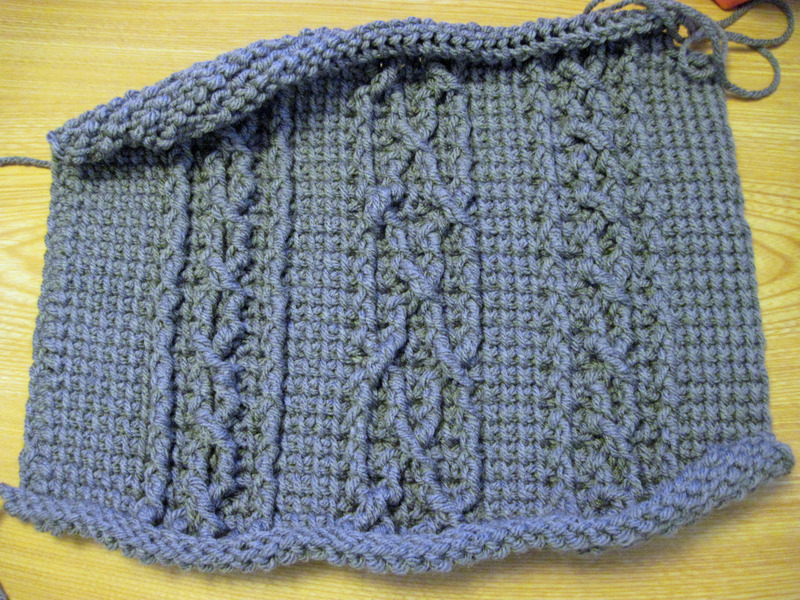 If you want to try Tunisian, there are some easy free patterns on CrochetMe. WIP: Cabled Tunisian simple stitch boy’s jacket, front. 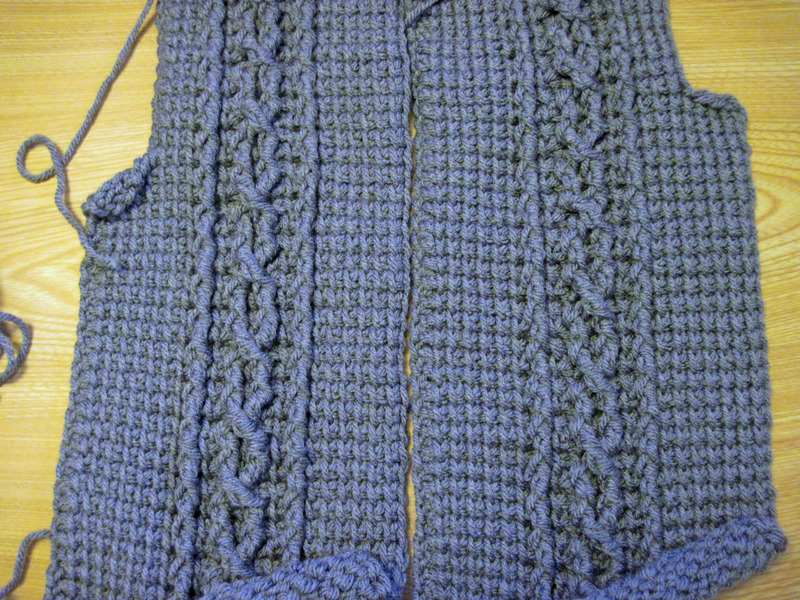 WIP: Cabled Tunisian simple stitch boy’s jacket, back, unblocked, worked up to arm holes. I still think the cables look better on Tunisian fabric than on regular crocheted items, and I’d like to try making the pillow shown in Toni Rexroat’s post about crochet for the home on Crochet Me in Tunisian. That’s another project for another night of The Walking Dead.